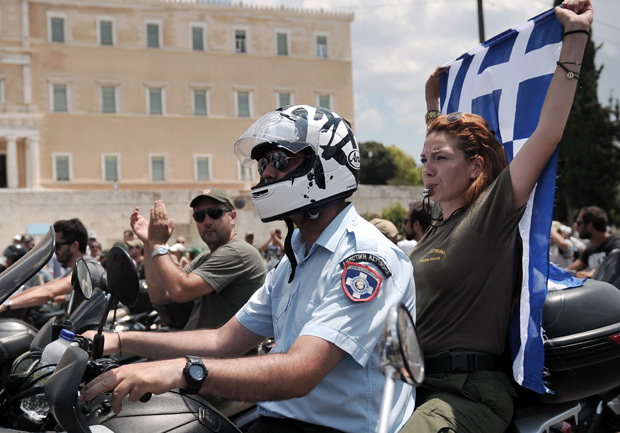 ATHENS, Greece Greeks earning more than 100,000 euros ($132,500) a year will have to pay for their own police protection from potential terrorist and organized crime attacks, under new cost-cutting plans. The Public Order Ministry said Tuesday that wealthy citizens will have to pay 2,000 euros ($2,650) per month for each officer acting as a bodyguard and a daily fee of 50 euros for use of a patrol car. Ongoing attacks by far-left and anarchist militant groups have stretched police budgets along with repeated government spending cuts in the crisis-hit country. The new pay-for-protection scheme still requires Finance Ministry approval and will not include elected officials or public sector executives. Bailed-out Greece is suffering through a sixth year of recession, worsened by years of austerity measures demanded by rescue lenders. On Monday, Greece's prime minister urged European leaders to shift economic policies toward generating growth, as the country's bailout monitors complained it was making "slow progress" on key long-term reforms. Antonis Samaras warned Greece's recession was hurting the government's efforts to reduce debt. It was "worsening problems that we must solve and complicating reforms which we must complete," he said. But Samaras, who held talks in Athens with Italian Premier Enrico Letta, said a Greek recovery would not be possible unless the group of 17 European Union countries that use the euro emerges from recession. "Greece, Italy and all of Europe are in need of policies that combine reforms and deficit reduction with growth," Samaras said. "Of course we cannot have growth while Europe is retreating into recession." The eurozone has been in recession for 18 months, while Greece's economy has been contracting rapidly since late 2008 and remains in serious crisis.